Major factors that should be considered when caring for houseplants are moisture, light, soil mixture, temperature, humidity, fertilizers, potting, and pest control. For specific houseplant needs, check the tag that sometimes comes with a plant, the package, or find care instructions for the species in a book or online. The following includes some general guidelines for houseplant care. 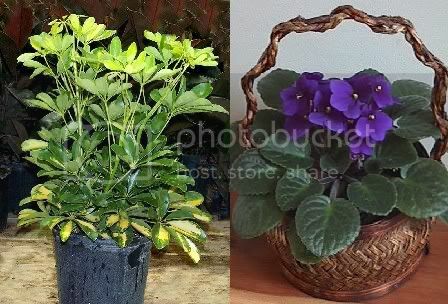 Both under-watering and over-watering can be detrimental to a houseplant. The best way to determine whether a plant needs water is to check the soil moisture. To do this, feel the soil on the surface and slightly below the surface. Soil moisture can range from very damp (as it would feel just after watering) to very dry. Typically, a houseplant needs to be watered about once a week, though setting a rigid watering schedule is not recommended. If a plant does need to be watered, pour water evenly over the surface of the soil until it begins to drain out the bottom of the pot, ensuring complete saturation. Most houseplant pots sit on a drip tray, do not allow the water that drains from a houseplant after watering to remain in that drip tray for more than 15mins. Through the process of photosynthesis, plants convert the energy in sunlight to chemical energy, which fuels plant growth. The two important factors for providing light to a house plant are intensity and duration. Different plants require different light intensities. Intensity (or quality) of light is difficult to measure without a light meter. It is usually measured in units of lux. 100 lux or less is usually considered "low intensity" or "indirect" lighting. A bright office has about 400 lux of illumination. 1,000 lux or more is usually considered "high intensity" lighting. Direct outdoor sunlight is in the range 32,000-100,000 lux. The duration of light exposure is as important as the intensity. Quality exposure of 8 to 16 hours is ideal for most plants. Windows are the most common sources of light for houseplants. In the Northern Hemisphere, south-facing windows have the most sun exposure, while western, eastern, and north-facing windows have progressively less exposure. Direct sunlight is ideal, but natural sunlight through windows is unpredictable â€” seasonal changes, cloud covering, and window treatments can affect the amount of light passing through. Artificial light sources can provide an alternative or supplement to window lighting. Fluorescent lighting provides excellent light quality whereas standard incandescent bulbs do little to promote plant growth. "Cool", or "blue", fluorescent lights provide the light needed for green foliating plants, while "warm", or "red", fluorescent lights provide the light needed for blooming flowers. Fluorescent bulbs that fit into standard screw-in light sockets are readily available. 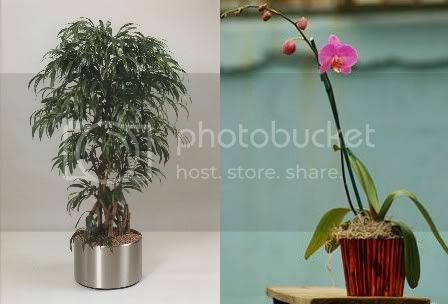 Houseplants are generally grown in specialised soils called potting compost or potting soil, not in local natural soil. A good potting compost mixture includes soil conditioners to provide the plant with nutrients, support, adequate drainage, and proper aeration. Most potting composts contain a combination of peat and vermiculite or perlite. Concern over environmental damage to peat bogs, however, is leading to the replacement of peat by coir (coconut fibre), which is a sustainable resource. A nutrient rich compost can usually be bought wherever potted plants are sold. If local natural soil is to be used, it should first be heat sterilized by placing the soil in an oven at 90Â°C (194Â°F) for at least 30 minutes. This will ensure that the soil does not contain any harmful bacteria. Most locals soils, especially those with a high proportion of clay, do not drain well enough to be a suitable growing medium for houseplants. Coir or peat is used to increase aeration and make heavy soils more absorbent. Vermiculite and perlite aid in drainage in a soil mixture. Perlite is recommended over vermiculite because it does not break down as easily. A coarse grade sand or grit can be used as a substitute for a drainage mechanism if needed. These three ingredients can be mixed in varying ratios to create different potting soil types. For a plant that requires fast drainage, such as a cactus, use plenty of coarse sand, grit or perlite. For a plant that requires plenty of moisture, use more coir. A good all purpose soil mixture is 2 parts coir and 1 part perlite or vermiculite. A so-called "heavy soil mix" will contain sterilised soil, milled sphagnum moss or coir, and perlite in equal proportions. It is also possible to make a soil mixture that actually contains no soil by mixing equal parts peat moss and perlite (or vermiculite). The soiless mixture will retain more moisture. Most houseplants are tropical species selected for their adaptation to growth in a climate which ranges from 15Â°C to 25Â°C, similar to the temperature in most homes. Temperature control for other plants with differing requirements needs attantion to heating and/or cooling. Humidity is slightly more difficult to control than temperature. Most plants thrive in 80% relative humidity while most homes are usually kept around 20% to 60% relative humidity. Besides buying a humidifier, there are a few things that can be done to increase humidity around houseplants. One of the most popular methods used to raise the ambient humidity around a houseplant is to use a pebble tray which is made by filling the drainage pot used by the plant with small pebbles, rocks, polished glass or similar material. The tray is then filled with water and over time the water will evaporate and increase the humidity around the plant. Other methods of raising humidity include grouping plants closely together and not placing plants in drafty areas. In a potted environment, soil nutrients can eventually get depleted. Adding fertilizer can artificially provide these nutrients. However, adding unneeded fertilizer can be harmful to the plant. Because of this, careful consideration must be taken before fertilizing. Slow growth, the yellowing of leaves, and the dropping of new leaves are all signs that a plant could benefit from fertilizer. Fertilizers are usually marked with a number such as 20-20-20. These numbers indicate the percentages of nitrogen, phosphorus, and potassium, elements that are needed for plant growth. 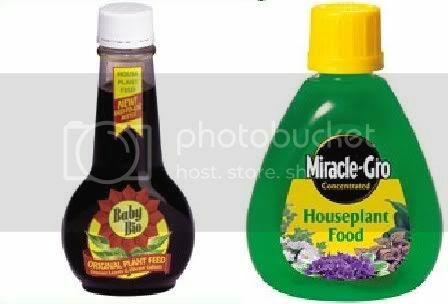 A 20-20-20 mixture is usually good for green foliating plants, while a 10-20-10 is usually better for flowering plants. The safety of fertilization depends upon the use of a product that can be diluted. While variation may occur between brands, a general rule is to mix 1 tablespoon to every gallon of water. In all cases, it is better to under-fertilize than over-fertilize. The diluted mixture is then used to water the plants. The growth of the plants should be monitored to determine if the fertilizer is helping or harming, and how often (if at all) it should be used. Schedules can range from every other week to every three months. Proper pot size is an important factor to consider. A pot that is too large will cause root disease because of the excess moisture retained in the soil, while a pot that is too small will restrict a plant's growth. 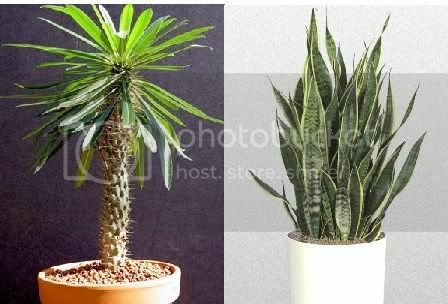 Generally, a plant can stay in the same pot for two or so years. Pots come in a variety of types as well, but usually can be broken down into two groups: porous and non-porous. Porous pots are usually clay and are highly recommended because they provide better aeration as air passes laterally through the sides of the pot. Non-porous pots such as glazed or plastic pots tend to hold moisture longer and restrict airflow. Another needed feature is drainage holes. Usually pots come with holes in the bottom to allow excess water to flow out of the soil which helps to prevent root rot. If a pot does not have drainage holes, a substitute drainage mechanism can be made by placing clay shards or pebbles at the bottom of the pot before filling it with soil which will cause the excess water to pool in the bottom of the pot instead of the soil. Wash old pots thoroughly in a dishwasher or by hand to kill any bacteria that may remain. I have a yucca plant and the ends of the leaves are all turning brown. does it need nourishing?